Definition at line 48 of file sysparams.h. Definition at line 58 of file sysparams.h. Referenced by SpiGetSet(), and SpiUpdatePerUserSystemParameters(). Definition at line 152 of file sysparams.h. Definition at line 146 of file sysparams.h. Referenced by SpiGetSet(), and SpiSetWallpaper(). Definition at line 72 of file sysparams.h. Definition at line 132 of file sysparams.h. Definition at line 129 of file sysparams.h. Definition at line 149 of file sysparams.h. Definition at line 125 of file sysparams.h. Referenced by IntGetFontRenderMode(), SpiGetSet(), and SpiUpdatePerUserSystemParameters(). Definition at line 148 of file sysparams.h. Definition at line 105 of file sysparams.h. Definition at line 120 of file sysparams.h. Definition at line 130 of file sysparams.h. Referenced by InitMetrics(), SpiGetSet(), and SpiUpdatePerUserSystemParameters(). Definition at line 82 of file sysparams.h. Referenced by InitMetrics(), IntFixMouseInputButtons(), MsqGetDownKeyState(), NtUserCallOneParam(), SpiGetSet(), and SpiUpdatePerUserSystemParameters(). Definition at line 77 of file sysparams.h. Referenced by co_IntProcessMouseMessage(), SpiGetSet(), and SpiUpdatePerUserSystemParameters(). Definition at line 78 of file sysparams.h. Definition at line 80 of file sysparams.h. Definition at line 81 of file sysparams.h. Definition at line 121 of file sysparams.h. Definition at line 60 of file sysparams.h. Definition at line 111 of file sysparams.h. Definition at line 112 of file sysparams.h. Definition at line 154 of file sysparams.h. Definition at line 71 of file sysparams.h. Referenced by InitMetrics(), and SpiGetSet(). Definition at line 83 of file sysparams.h. Definition at line 153 of file sysparams.h. Definition at line 75 of file sysparams.h. Definition at line 143 of file sysparams.h. Referenced by IntPaintDesktop(), and SpiSetWallpaper(). Definition at line 156 of file sysparams.h. Definition at line 158 of file sysparams.h. Definition at line 157 of file sysparams.h. Referenced by DefWndHandleSetCursor(), SpiGetSet(), and SpiUpdatePerUserSystemParameters(). Definition at line 155 of file sysparams.h. Definition at line 104 of file sysparams.h. Definition at line 131 of file sysparams.h. Definition at line 79 of file sysparams.h. Definition at line 124 of file sysparams.h. Referenced by SpiGetUserPref(), SpiSetUserPref(), and SpiUpdatePerUserSystemParameters(). Definition at line 100 of file sysparams.h. Definition at line 142 of file sysparams.h. Definition at line 59 of file sysparams.h. Definition at line 106 of file sysparams.h. Definition at line 89 of file sysparams.h. Definition at line 90 of file sysparams.h. Referenced by co_IntProcessMouseMessage(), NtUserGetDoubleClickTime(), SpiFixupValues(), SpiGetSet(), and SpiUpdatePerUserSystemParameters(). Definition at line 88 of file sysparams.h. Definition at line 92 of file sysparams.h. Definition at line 91 of file sysparams.h. Definition at line 107 of file sysparams.h. Definition at line 118 of file sysparams.h. Definition at line 53 of file sysparams.h. Definition at line 86 of file sysparams.h. Referenced by IntTrackMouseEvent(), IntTrackMouseMove(), SpiGetSet(), and SpiUpdatePerUserSystemParameters(). Definition at line 87 of file sysparams.h. Referenced by IntTrackMouseEvent(), SpiGetSet(), and SpiUpdatePerUserSystemParameters(). Definition at line 85 of file sysparams.h. Definition at line 84 of file sysparams.h. Definition at line 93 of file sysparams.h. Definition at line 119 of file sysparams.h. Definition at line 110 of file sysparams.h. Referenced by DoTheScreenSaver(), SpiGetSet(), and SpiUpdatePerUserSystemParameters(). Definition at line 94 of file sysparams.h. Definition at line 52 of file sysparams.h. Definition at line 76 of file sysparams.h. Definition at line 51 of file sysparams.h. Referenced by InitMetrics(), IntPaintDesktop(), SpiFixupValues(), SpiGetSet(), and SpiUpdatePerUserSystemParameters(). Definition at line 101 of file sysparams.h. Definition at line 70 of file sysparams.h. Definition at line 102 of file sysparams.h. Definition at line 139 of file sysparams.h. Referenced by InitMetrics(), SpiFixupValues(), and SpiUpdatePerUserSystemParameters(). Definition at line 138 of file sysparams.h. Referenced by InitMetrics(), and SpiFixupValues(). Definition at line 103 of file sysparams.h. Definition at line 55 of file sysparams.h. Definition at line 54 of file sysparams.h. Definition at line 127 of file sysparams.h. Definition at line 128 of file sysparams.h. Definition at line 126 of file sysparams.h. Definition at line 150 of file sysparams.h. Definition at line 145 of file sysparams.h. 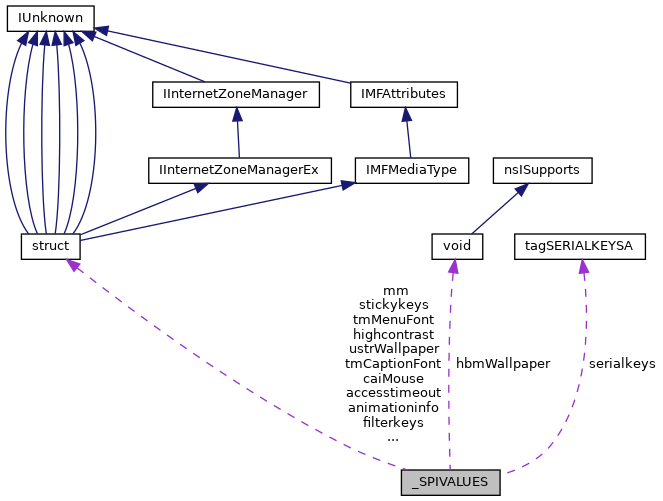 Referenced by SpiGetSet(), SpiGetSetProbeBuffer(), and SpiSetWallpaper(). Definition at line 144 of file sysparams.h.